If you've read my previous post about BetaScript, you know what's behind this cut. 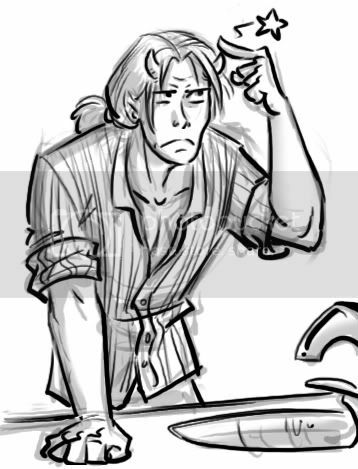 I had said:" Someone give me a FACTUAL and HISTORICAL link to Sargon II and locksmithing and I'll draw you a naked Zhao." I posted the same thing in DA, and gave a sketch to Roselegend6 who was the first one to mention the lock in Sargon II's tomb. That's her character, Lier. Heehee, that was fun! I should make historical trivia and the first person with the right answer gets a sketch. I am fangirling in advance about this film. 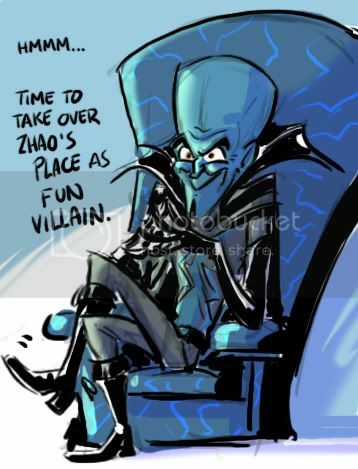 I can't say much right now, but what I've seen of it makes me want to draw more Megamind. I hope there's a trailer attached to Dragon. One evening sketching for fun for myself. Haven't had that in a while. Enjoying it while I can. Oh scrap, I had forgotten about that movie, ha ha! Last guy is Megamind (Aka Mastermind, aka Oobermind...he went through a few name changes). A character in a future Dreamworks film. LOL! You are awesome for using a 'Men in Tight' quote! The trick is finding the right key. It's Men In Tights night! Hm...Can't remember if I've watched Men in Tights. That's the Robin Hood one, isn't it? Zhao in what amounts to a chastity belt. Priceless. Yup! Robin Hood; Men In Tights. Haven't watched it in years. Zhao and chaste. Two words that don't fit together. *snicker* Although it would be really funny if he had been married, and his son comes up and picks a fight. "You never call, you never write, you never remember my birthday!" T_T Rawr. Agni kai..
J'allais ecrire de quoi mais c'est exactement ce que tlc010 a écrit XD (le lien avec Héros en collants et c'est qui Megamind...) Ça va te sauver une réponse! Je pourrais traduire ma reponse en francais, ha ha! Dragon dans moins d'un mois! Moi aussi j'ai hate de voir le produit final. Le Art Of Book est sweet (j'ai pas d'image dedans et je ne suis pas dans la photo de groupe- j'etais au marriage de mon cousin cette journee la! ).